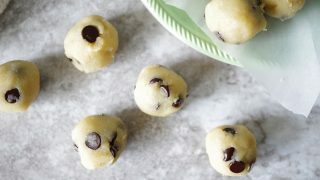 These paleo chocolate chip cookie dough bites are dairy-free, gluten-free, grain-free, and egg-free. They are smooth, creamy, and add just the right amount of sweetness to satisfy any craving. 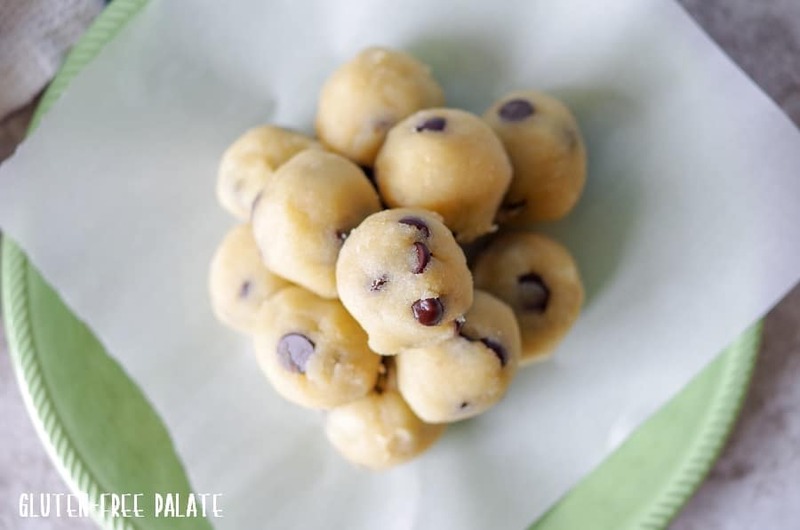 You guys are not going to believe how amazing these Paleo Chocolate Chip Cookie Dough Bites are! 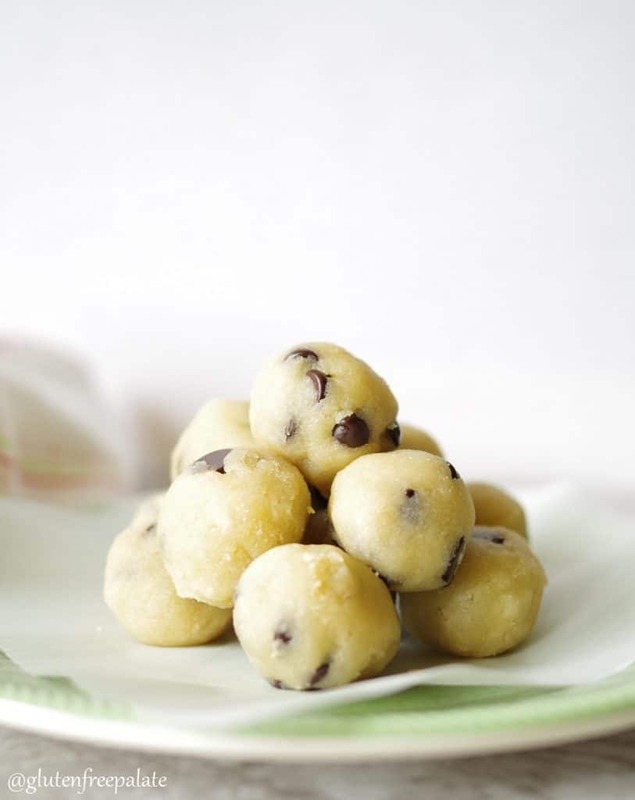 They are so easy to make and they taste like chocolate chip cookie dough. They are not only amazingly delicious, they are healthy as well. 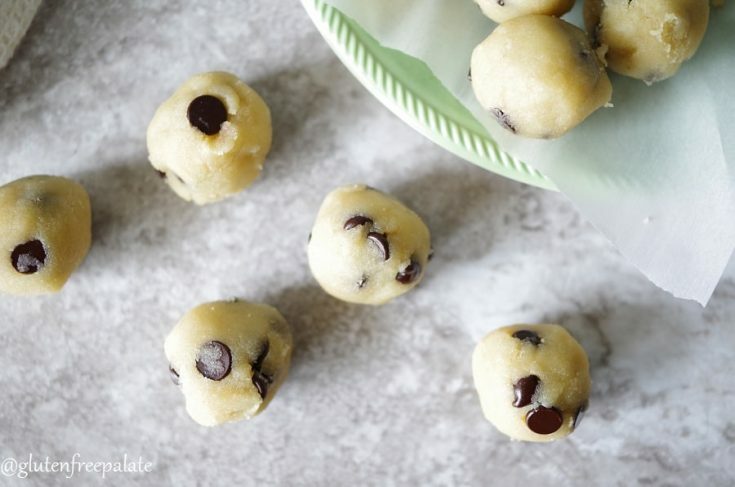 You can freeze these grain-free cookie dough bites if you don’t want to eat them all at once. You can eat them as is, or dip them in dark chocolate for an extra special treat. Use cocoa nibbs, or dark chocolate to make them Paleo! I’ve listed some information below on how to make these paleo chocolate chip cookie dough bites. Also, I have a video for those of you that are visual like me. I actually found myself hoarding these paleo chocolate chip cookie dough bites from the rest of my family. We have a separate small fridge for drinks, and I hid a container of these in the back so I could keep them all to myself. I’m not even joking. It was terrible, but I feel no guilt. Well, other than the fact that I had to hit the gym twice as much. They may be healthy but the calories still add up when you eat the whole batch. So don’t eat the whole batch at once. Either share them, or freeze some. I’ve frozen them into smaller balls and mixed them in with dairy-free ice cream for homemade cookie dough ice cream. Delish! Coconut oil works best since it solidifies nicely. If you can’t have coconut, you can use avocado oil. While avocado oil doesn’t solidify easily it does have a mild flavor that works well with the rest of the ingredients. Start with 3 tablespoons of oil and add in the 4th if needed. One thing to note about using almond flour is that it is NOT a 1-to-1 for gluten-free flour. It has a lot more protien and fat, and less starch, so it reacts differently in recipes. It’s best stored in the refrigerator or freezer if you’re not going to use it up in a week or two. Always bring Almond meal or flour to room temperature before baking with it. If you use it cold, it’ll absorb more of the liquid and your batter will be thicker than it should be. And remember, because it’s made from almonds, it can go rancid, so keep track of when you opened the bag. If you like these Paleo Chocolate Chip Cookie Dough Bites, you might also like my Oatmeal Raisin Cookie Dough Bites, or my Gluten-Free, Dairy-free Raw Gingerbread Cheesecake. Both are no-bake, and use minimal ingredients, and both are delicious. If you’re looking for a nut-free version that is also spreadable, you’re going to LOVE this Gluten Free Edible Cookie Dough from Fearless Dining and this Gluten Free Cookie Dough from Flippin Delicious. You can never have enough edible cookie dough! Stop back by and let me know what you thought. If you have any questions please leave a comment below and I will get back to you. These paleo chocolate chip cookie dough bites are dairy-free, gluten-free, grain-free, and egg-free. In a medium mixing bowl, mix the coconut oil, dairy-free milk, and maple syrup. These are going to be gone in MINUTES when I make these. So delicious dear! Thanks for sharing! Thank you! They are dangerous to make. Sooo smooth and creamy, like real cookie dough! My husband would love these, chocolate chip cookies are his fav and not having to bake them is MY fav HA! Thank you Brianna. I keep them on hand for the same reason 😉 I love cake… a little too much. Honey is a great alternative for maple syrup. Thank you for sharing! Hi, I’m allergic to almonds, would whole wheat or oat flour work as a substitute? I can’t wait to make these! I haven’t tried it with oat flour, but it might work. What I usually recommend as a substitute is pecan flour or hazelnut flour. About how many calories do you suppose these would be? And would you be able to cook these? The calories depend on the size of each cookie dough bite and the exact ingredients you use. These are meant to be eaten raw, with no eggs – I would not cook them. Has anyone ever had any issues with the dough setting? I made this exact (except I used whole wheat flour instead of almond flour), and my dough is remaining more powdery and not able to form into balls. Would the wheat flour make a difference? This recipe calls specifically for almond flour due to the natural oils in it, the texture, and the way it helps bring the dough together. Wheat flour will not work in this recipe. These are made with amond ‘flour’ for a reason…it doesn’t need to be baked. Wheat flour is not a good substitute because it needs to be cooked in some waya. You can subsitute oat flour, but let it sit a bit longer for the oat to absorb the moisture. You’ll also need to adjust the almond milk in the recipe though. I also had an epic fail. The coconut oil & milk doesn’t hold after being in fridge. Maybe make balls first then refrigerate? What kind of almond flour did you use? The coconut oil will congeal in the fridge, and there’s only 3 tablespoons of milk. They may not hold if: You don’t use the exact ingredients, or the almond flour absorbed it (depends on the brand you used). Let them come to room temperature and then roll into balls before placing them back in the refrigerator. Allisons dough didn’t’ hold because she used wheat flour. This recipe calls for Almond flour. Very different properties. Just made these! They are in the fridge now but I did do a sneak taste. Yumm-Oh-My!! I did sub some sugar free maple syrup, which I wasn’t sure if that’d work, but it was what I had. Thank you for this super easy, super yummy treat!! So glad you tried them and liked them! 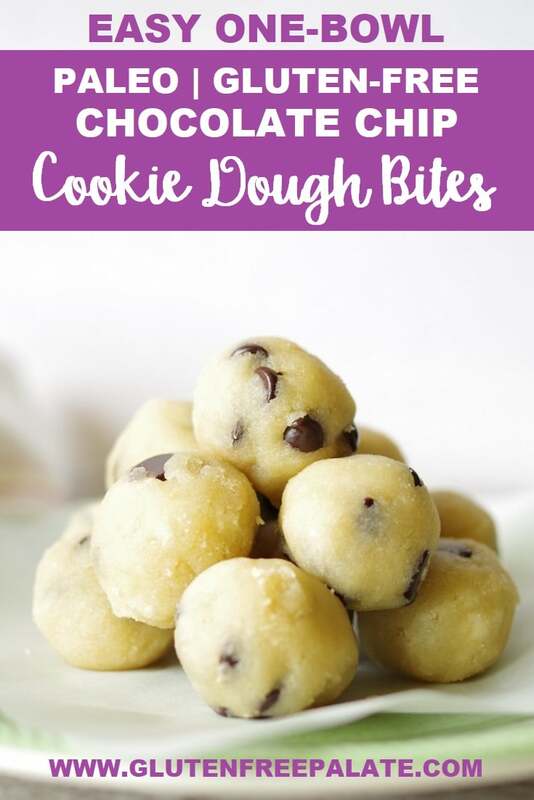 Most of the time not all the dough makes it into the fridge at my house 😉 I like to freeze some of the cookie dough bites, or make smaller ones to put in yogurt or ice cream. Sugar free maple syrup?!? As a Vermonter, I’m assuming that would just be water? Haha. That gave me a chuckle. I don’t think of pure maple syrup as a refined sugar 🙂 You are welcome to use honey, if that works for you. These look incredible!! Do you think coconut flour would work okay? Thank you for the compliment. I haven’t tried them with coconut flour. If you try it please let me know how they turned out and I’ll add a note to the post. What can you use if you have a coconut allergy? You can use avocado oil (it’s mild in taste). Start with 3 tablespoons since it’s in liquid form. If the dough is dry still, add in the 4th tablespoon. Just note the flavor will be slightly different.